Full disclosure: I’m the type of dude who likes to go out into the street, smell the fragrant odor drifting from a nearby waste transfer station, watch as the wind blows fragments of dust and paper refuse into my face, and scan the streets for a cab. That is, when I can afford a cab, which is not most of the time, and in that case I walk to the subway. So I’m more prone to do that than pick up my smartphone and tap a few times to get my heart’s desire, just like I’d rather walk into a crowded room, feel out the vibe and maybe even pick up the scent of someone I might be attracted to rather than go on a dating app and look at 2-dimensional digital images. So I’m not exactly a sharing economy enthusiast, I suppose, although I would probably take up Airbnb’s offer to put me up in Havana for free for a week. I’ll grant that many of you are not as interested in the visceral experience of 20th century life as I might be, but this UBER thing, as it has played out in New York, kind of caught my eye this week. It was strange enough the way our Progressive Mayor Bill de Blasio suddenly caved in on his stance against UBER expansion on our streets. But it really got doubly strange when City Council Speaker Melissa Mark-Viverito held an emotional press conference yesterday accusing the Mayor of sexism and perhaps anti-Latino bias for implying that, he, not she, brokered the agreement with UBER, and that the regulatory cap on the hedge-fund backed darling of hipster capitalism might still be on the table. What I don’t get is why compromise with a company and business model that seems to fly in the face of union interests–a major part of the Speaker’s base–as well as the Vision Zero Initiative that was such a central part of the de Blasio and City Council policy-making agenda? And how is it that by merely saying he could table the cap during the length of the study when it was the City Council’s decision, the same one that almost voted for it–that de Blasio is such an affront to the City Council’s autonomy? Not to mention, what is the point of taking a huge public dump on de Blasio by essentially supporting his arch-enemy Governor Andrew Cuomo’s position in the midst of a week of press about how that particular conflict is getting increasingly testy? Why choose this issue to assert one’s, I mean, the City Council’s political autonomy? UBER has claimed that de Blasio is bought off by big taxi medallion owner interests, but a quick scan of Mark-Viverito’s campaign contribution disclosure lists several car services and non-UBER donors (as well as big real estate and finance capital funds). So let’s assume there are other ideological or political motivations out there. Scott Stringer and Carolyn Maloney have argued vociferously in favor of UBER as a job-creator and that limiting its operations would stifle New York’s “entrepreneurial spirit.” Once again running in fear of the Republicans’ and neoliberalism’s free-market-or-die agenda, Democrats are increasingly worried about being accused of being “out of touch” with the emerging sharing economy because they actually give importance to the impact of a business model on working conditions and the interests of the individual laborer. As far as UBER’s media strategy, let’s face it, medallion cab drivers are an easy target. It’s simple to draw on the widely held opinion that the New York taxi driver is “rude” and even belligerent. The current UBER PR blitz, all $3.2 million of it, portrays the UBER driver as being independent, resourceful, entrepreneurial, and willing to go anywhere in the city for fares. This rosy picture is of course, completely lacking in the grim historical context of the lot of medallion cab drivers: In the 1980s, taxi driver unions were among the first to be crushed in the Reagan years. Where they once had collectively bargained salaries and health insurance, they were forced by medallion owners to become independent contractors and lease their cars, compelling them to take on the risks of the market, in a way similar to the imposition of rent on peasant farmers in England in the 18th century. Cab drivers often work 60 or more hours a week in deadly New York traffic for what amounts to minimum wage. When you consider that the stripping of taxi drivers of their union protections didn’t happen in quite the same way in European countries like France, it’s no wonder Parisian taxi drivers confronted UBER with angry protest. Remarkably similar in tone, these ads ignore the baseline logic on which the taxi business operates. While racism is often involved, the primary motivating factor is that medallion taxi drivers prefer to pick up and drop off passengers in the center, or core areas of New York as a matter of profit maximization. While it is just to view taxi service as something that serves the public in a fair way, criticizing taxistas’ reluctance to take fares to the outer boroughs is, in effect, dampening their entrepreneurial spirit. So as citizens we all agree that the taxi business–more urgently than renting a room and finding a date–has to be committed to balancing public need with consumer markets and profit margins. The unexplored issue here is, why are there huge areas of the city inhabited by poor people who don’t have the same consumptive power as the gentrified center? Why is it that widespread corporate tax breaks make it impossible to fund a mass transit system that, if it were as efficient as Europe’s, would make taxis less of a need for people of color in peripheral neighborhoods? Also, given that most owners of smartphones are young and affluent, isn’t UBER more likely to serve gentrifiers living in the outer boroughs rather than longtime residents, who often only carry cash and are quite accustomed to flagging down any car that is essentially a big motor boat with wheels displaying a flag decal from some Caribbean nation? Given the growing inequality in New York, in the long run UBER drivers will ultimately behave in the same manner as yellow cab drivers, perhaps even more poorly, since there are few regulatory mechanisms overseeing them, and those regulatory mechanisms are precisely what the owners of UBER are trying to avoid by intimidating the city through a massive public relations campaign to accept their presence before any studies as to their impact are done. It’s frankly alarming that companies like UBER, whose valuation has more to do with venture capital speculation on their projected future earnings than actual profits, can almost overnight exert tremendous influence, if not practically dominate public policy. The drive to provide some concrete numbers for this profit-laden future is what is behind their almost desperate attempt to eviscerate any resistance to their business model in New York. Ad buys and massively funded PR campaigns such as UBER’s have been emerging as one of the biggest threats to 21st century democracy. UBER has been long advised by Obama campaign advisor David Plouffe, but perhaps this most recent PR game was refined by Plouffe’s replacement (he was kicked upstairs in May) Rachel Whetstone, who comes to UBER by way of Google, and yes, a dodgy English crew known as the “Notting Hill Set” that paved the way for David Cameron’s reign as Conservative Prime Minister. Talk about globalization. Those Brits sure know how to drive a hackney carriage, don’t they? I’m told the exam for the license is grueling and exacting. Maybe that’s what we should insist on here in New York rather than “compromise” and conduct studies on a company that has already shown a ruthless inclination to investigate journalists who write critically about them in order to discredit them. 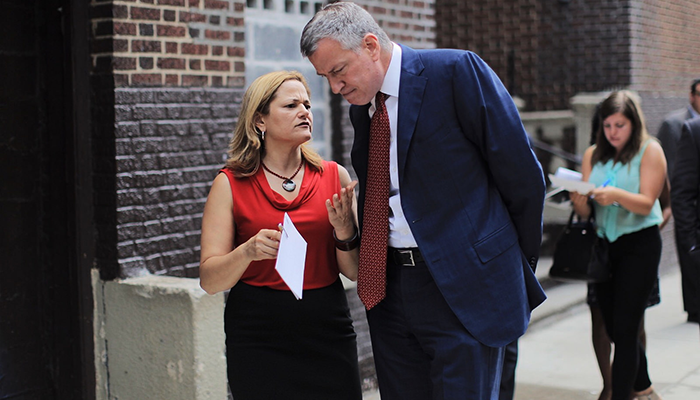 There’s no doubt that there is pervasive sexism in power politics, and I’ve already written about Mayor de Blasio’s questionable record in hiring Latina/os and taking our issues seriously. And I’m not suggesting that a taxi medallion monopoly should stand in the way of fresh ideas and new business models. It’s just that what we have here is a case of one budding monopoly trying to extinguish another, and we’re kidding ourselves if any entity backed by that much Wall Street money has the public interest at heart.